Kids across the city are gearing up for Halloween tonight and relishing in the amounts of candy they’ll be hauling in this year. What they might not realize is that October isn’t just known for Halloween. In our office we and our Manteca dentist celebrate National Dental Hygiene Month. Oral hygiene awareness is very important part of growing up as the skills children learn now will benefit them for the rest of their lives. One cavity isn’t going to pop up overnight, but plaque buildup and tooth decay start damaging teeth in as little as five hours after the last time you brushed your teeth. Today, we’ve compiled a list of a few ways you can keep your teeth and your children’s teeth safe and healthy while learning some great health tips along the way. Visit our Manteca dentist twice a year for your regular dental exams. Skipping these visits gives tooth decay and cavities more time to harm your teeth and beautiful smiles. Always brush your teeth after eating sweets and candy. This will erase the sugars that like to form on teeth and grow into cavities. Drink water. Water cleans and rinses out your mouth and is a big part of your everyday health need. Floss your teeth each day in order to remove food that gets stuck between teeth. The most common cavity sites for children are between teeth from a lack of flossing. In a perfect world we would eliminate candy so that you and our Manteca dentist don’t have to battle tooth decay. In reality, we know how hard it is to say no to a little sweet once in awhile. Additionally, many of the foods we eat, which aren’t candy, break down into sugars and cause just as much damage as candy. So, to combat tooth decay, brush and floss. Another good idea is to look into getting dental sealants. Sealants protect the surfaces of teeth where plaque likes to hide. 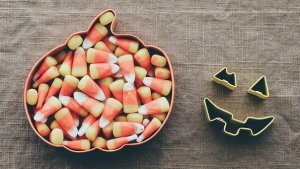 Gorging on Halloween candy is a rite of passage for most children. However, no matter how late it gets in the evening on Halloween night; don’t let your children go to bed without taking care of their oral health. Help little ones out if necessary and supervise older children. Encouraging a good oral health regimen will keep teeth and smiles looking great and prevent gum disease. If you need help reminding yourself or your children about the importance of oral health, join us on Facebook. We’re also happy to answer any questions you have. Visit our Manteca office for a consultation or give us a call. We want you all to have a happy Halloween, but we want your smile to be happy as well.